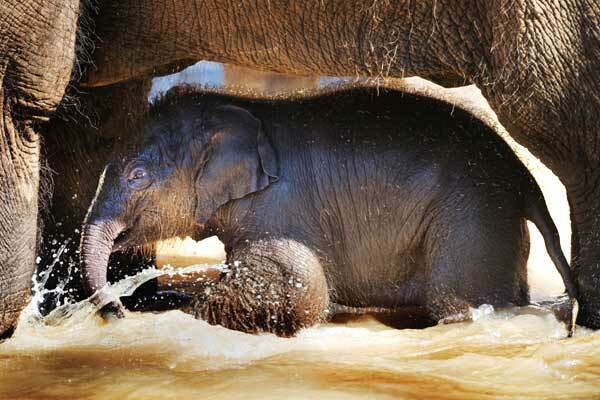 Similar to the hoopla surrounding the baby panda in Thailand, Australia’s Melbourne Zoo has had to extend its public viewing hours to a huge number of visitors coming to see the zoo’s new resident - a Thai baby elephant. Up to 3,000 people line up daily to get a glimpse of the baby elephant, born last month. The baby elephant was conceived by artificial insemination. In keeping with the Thai tradition of naming female elephants after flowers, five floral-themed names have been shortlisted from about 30. The Australian premier has called for Australians to cast a vote. The five shortlisted names are Leelawadee, Mali, Maliwan, Sumali, and Lyares. Mali gets the prime minister’s backing, as jasmine is his favorite flower. Similar to the hoopla surrounding the baby panda in Thailand, Australia’s Melbourne Zoo has had to extend its public viewing hours to a huge number of visitors coming to see the zoo’s new resident—a Thai baby elephant. Up to 3,000 people line up daily to get a glimpse of the baby elephant, born last month. The baby elephant was conceived by artificial insemination. In keeping with the Thai tradition of naming female elephants after flowers, five floral-themed names have been shortlisted from about 30. The Australian premier has called for Australians to cast a vote. The five shortlisted names are Leelawadee, Mali, Maliwan, Sumali, and Lyares. Mali gets the prime minister’s backing, as jasmine is his favorite flower.